Movie Review: “Beloved Sisters” is a biographical film that portrays the long-lasting love triangle lived in the 18th century between the German poet and philosopher, Friedrich Schiller, and the aristocratic von Lengefeld sisters, Charlotte and Caroline. The drama, written and directed by Dominik Graf, a filmmaker with a three-decade career of TV movies and series, was unable to hold my attention apart from the first half-hour. Despite handsomely crafted in its attempt to revive the period and attractively photographed by Michael Wiesweg, the film gradually loses impact and even drags itself on several occasions, during its protracted 138 minutes of the same cadenced maneuvers focusing on the noble German social and literary society. Faith has determined that the young Schiller (Florian Stetter), exiled from its country and lost in the streets of Weimar, will meet Charlotte (Henriette Confurius) in a time when she was preparing herself to get married with some illustrious, wealthy man, following the steps of her sister Caroline (Hannah Herzsprung), who had done it, not for love, but to guarantee financial stability for her family. Defying both society and family, both sisters fall in love with the amiable and yet revolutionary thinker, consciously assuming their affair and understanding whenever they need to get out of each other's way. Regardless the many obstacles, like looking like a beggar and being broke, Schiller ends up marrying Charlotte and having a child with her, but never ceases from seeing her unhappily married sister, who starts a successful literary career under the name of Agnes von Lilen. 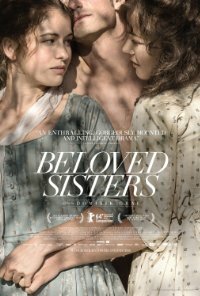 Resorting to close-ups of the protagonists in an attempt to draw the emotions that the plot couldn’t assure, the slightly staged “Beloved Sisters” is leisurely paced, never flowing conveniently to escape its shallowness. Here, we get more lethargic and bored than invigorated or excited, and the film leaves no positive memories.